These are the projects that have been approved for funding this year. If you or your organisation have a project supporting women or girls in the Adelaide Hills that align with the Zonta values and would like financial or volunteer support please contact us. Every ninety seconds a woman dies of complications related to pregnancy and childbirth. Approximately 525,000 women die annually in childbirth, many from infections acquired during childbirth. For every woman who dies in childbirth, probably 30 incur injuries and infections - many of which are often painful, disabling, embarrassing and lifelong. 60 million women give birth each year with the assistance of a Traditional Birth Attendant or no assistance at all. Join us, Zonta Club of Mt Barker for our annual birthing kit assembly morning, (dates will be given upon request) and help save a life. The project is located in the Afar region of Ethiopia which has one of the lowest literacy rates in the country, due to the primarily pastoral/nomadic lifestyle of the local people and a history of limited investment in development infrastructure and education. As a result, the number of students from the Afar region who complete Year 12 with high enough scores to enter government-run universities is very low. Students who pass Year 12 but do not obtain a Tertiary entrance score must either repeat Year 12 or attend a private college in order to obtain higher qualifications and have a chance at a professional career – most families do not have sufficient money to fund a course of private Tertiary education. In addition to this, girls in the Afar region are further disadvantaged by expectations of early marriage (as young as 14), thereby not necessarily having the opportunity to complete even their secondary education. Barefoot Initiative (a South Australian-based NGO operated entirely by volunteers) has been collaborating since 2010 with APDA (i.e. a local indigenous NGO) to support Afar students who have completed high school to study at a tertiary level. They operate a scholarship program aimed at supporting selected Afar students who have graduated from Year 12 to attain a Tertiary qualification and thereby have the opportunity to reach his/her potential. It is also aimed at boosting the number of capable professionals within the Afar region who will work in the area of community health/development and in time become community leaders. Scholarship support for each student extends over a number of years – i.e. the time it takes to complete their Tertiary qualification as well as support on graduation to find a suitable professional position. Zonta funding would be used to assist with the provision of an annual scholarship to one female Tertiary student. Zonta Club of Mt Barker are currently in their 3rd year of assisting a young female student called Gumati to study a 4 year degree in Accountancy. This is a new project that the club is supporting this year. PK Mentoring Camps change young lives! – providing over 200 camping placements for children and youth with a parent in prison. 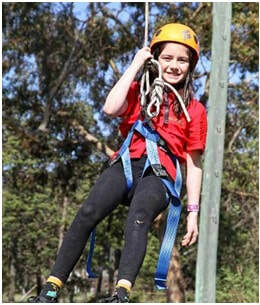 ​For the PKs (prisoners’ kids) who attend these camps – it is truly life changing. For Michelle* PK Mentoring Camps gave her hope and a new found sense of purpose that she could create a better future for herself. She is now the first person in her family to attend University. PK Mentoring Camps has encouraged him to make good life choices and not follow in his dad and brothers’ footsteps of criminal activity. Simon is now a volunteer leader – playing an important role as a positive role model to his peers. Les Dennis, Camps Liaison, is passionate about these camps and their impact because he knows only too well what it’s like to grow up with a parent in prison. This is a new project that the club will be supporting this year. ​Sharing with Compassion Incorporation has raised $18,000 in funding, which facilitated the building of a new girls’ dormitory at the High Standard Secondary College, one of our sponsor schools located in Kateera, Uganda. Our organisation partnered with a Zonta Club in Australia who are part of Zonta International providing advocacy and support to empower women around the world, who generously donated sufficient funds to buy three triple bunks for the dormitory.This will ensure more girls throughout the Kareera area will know have the opportunity to receive a secondary education. Winning photo in the 2016 What Zonta Means to Me Competition by Merrilyn Farrington titled " Womens' Hands Helping other Women". Two years ago Mt Barker Zonta group began making Breast Care cushions for women who had had breast surgery after cancer. These cushions are worn like a hand-bag so that the surgery site is protected from the arm. They are made from bright coloured soft poly-satin and filled with a soft polyfill. We have held several sewing mornings, two at Cornerstone College where we cut and sewed the shapes of the pillows and straps, and the others at my home to complete the cushions and package them ready for distribution. Twenty-two years ago I had breast cancer with a mastectomy to follow. At the time, these cushions were not available and I used a make-shift baby pillow, but I certainly appreciate how these lovely soft pillows would have been invaluable and made life more comfortable for me. We distribute the cushions through the local and further afield hospitals as well as with the help of Breast-care Nurses. To date we have made over 100 cushions. ​The Zonta Breast Care cushions provide comfort to women (and men) in the post-operative phase of breast surgery. Cushions are supplied to most hospitals in each Area. Distribution in hospitals is by Breast Care Nurses. Throughout the year Zonta Clubs in this District and others in Australia hold sewing bees to make these sought-after cushions. The feedback received from recipients has been positive, with one woman noting that receiving the cushion was a turning point for her in helping to change her outlook and feel more positive. Several years ago my grand-daughter worked as a volunteer at an orphanage in Kerala, southern India. The ages of the children ranged from babies whose parents had died of AIDS, to young adults up to age 18. Some of the children stayed well over the age of 18, and became workers there, or lived there so that they could attend high school or college. Hannah noted that the little ones often got treats and were well catered for, as were the older ones who attended school. But it was the BIG girls who seemed to be in the most need, and in particular for their personal health and hygiene. There was rarely enough money to pay for the necessities they required for their monthly periods, and so they often had to stay at home or indoors so that they would feel more comfortable. She believed that just a few dollars each month would help pay for the hygienic products they required. I proposed that we donated enough money for a year’s supply of products that could be purchased in bulk for the girls. As there are more than 15 girls who need these products, the money we send doesn’t go far. However, they are forever grateful for something that we take for granted and is readily available, and they can now go about their normal day as usual. The funds we send purchase sanitary items for the young women in the orphanage. Imagine life without them? The Zonta Club of Mt Barker Inc plans to make available in 2019 an Award that acknowledges a Year 12 female student in each of Eastern Fleurieu R-12 School and Mt Barker High School. The selected student in each school is expected to have displayed a high level of leadership and involvement in both their School and wider Community. This project was bought about when a young homeless woman was admitted to the Mt Barker Soldiers’ Memorial Hospital with no items. A Social Worker contacted our then President asking if we could assist this young girl. PJs, underwear and toiletries were provided and after consultation with hospital Management this project evolved. We have put together toiletry packs as per photo which are stored at the hospital to be given to women that are admitted to the hospital that have not personal belongings or homeless. The hospital Management are very appreciative of our club involvement and in this project and have already distributed a few packs to women in need. For two years, our Zonta members decided to forgo their individual end of year Kris Kringle gifts, and use the money to purchase personal and feminine hygienic products that we could then donate to women who were less fortunate than most of us. Members were very generous with their donations, and we were able to assemble 16 Bags of Love each year – using bags that had been donated by the Mylor CFS Op Shop, which were excess to their needs. These bags were then given out to women at a luncheon organised by a local church, to help make their Christmas a little happier. 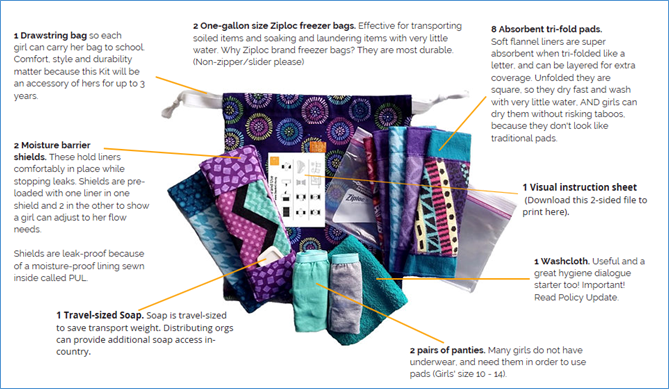 This year, rather than again ask members to provide all of the products we needed to complete the bags, we have applied to the membership for funds required to help purchase these products. However, so that we can still donate our Kris Kringle alternative, members will be asked to donate something a little special – ie hand cream, perfume etc., for the bags of love. Days For Girls is an ongoing project for our club this year, with the help and instructions from Days For Girls, South Australian Chapter. A washable Feminine Hygiene Kit for girls/women. Our Sewing Team from Zonta, will be machine sewing these kits. The absorbent tri – fold pads and moisture barrier shield last up to 3 years. To provide basic Obstetric and Gynaecological ultrasound training to midwives and doctors working in remote and aboriginal communities so that they can provide basic ultrasound services to patients who would otherwise have no access to ultrasound services. This will enable them to implement clinical management, early intervention to improve perinatal mortality and morbidity in remote South Australian Aboriginal communities.